This gemstone cocktail ring from the Miadora Collection is beautifully crafted from sterling silver and would make the perfect non-traditional engagement ring. Featuring a 5 3/5 carat octagon shaped green amethyst center stone and two round-cut white topaz side stones. All carat weights and measurements are approximate and may vary slightly from the listed dimensions. Treatment code E (Green Amethyst, White Topaz). See Treatment Guide for further information. Miadora Sterling Silver Octagon- cut Green Amethyst and White Topaz Split Shank Cocktail Ring looks just like the picture. Big and beautiful, but the color was lighter then shown. I thought it would be greener. The size I ordered was a size 7 and it was true to size. Lovely ring for the price. Very well made. I gave it to my wife as a small xmas gift, and she loves it. Some reviews said that the stone they received was almost clear. The color of the stone I received is almost identical to those pictured, but slightly more clear, ie not as much color. Received it yesterday! OMG.... it's pure elegance! The cut, weight, the color of the stone! MiaDora jewely Is a must! Ty Miadora! The color of the stone in the picture online is beautiful darker green setting . However, on the ring received , the stone is very, very light (almost clear) Preferablely , I would have prefer a darker stone but it is great for the price. We appreciate you taking the time to write a product review. We have inspected our inventory and removed any rigs with stones that were too light in color to ensure this issue will not happen again in the future. Thank you for shopping with us. I do not like Amethyst. Honestly, not a stone I'd ever considered, especiallly in green! However, I was looking for a large single stone that would be more of a statement compared to my other rings with multiple, smaller stones. When this popped up in my search, I was immediately taken with it. Inexplicably, given it was such a value, I purchased it expecting something no more than 'ho-hum'. Boy, was I WRONG! This ring is my new favorite. I was so surprised at the clarity of such a large stone, and the green color intensity changes wiith the type of light reflected from it. It's a very pale, light, kind of combination of shades that reminds me very much of clear rainforest streams. I wear it often, every week, and given it's clarity and light shade it never clashes with what I'm wearing. I love this ring and it has held up very well - even during those quick 'kitchen sweeps'. I've been impressed with Miadora jewelry since my first purchase years ago, and they continue to deliver VERY high, heirloom quality and beautiful gems at a very reasoonable price. This ring will not disappoint, and neither will Miadora! Nice Ring color of Green amethyst looks more white than green, but my daughter loves it! I love this ring! It's absolutely beautiful! The setting is a split shank with white topaz accent on each side. It looks so elegant. I normally wear a size 6 in a ring, but ordered a size 5 1/2 in this one, and, it fits perfectly. If you like a ring with a larger stone, and an elegant setting, you'll love this one! And, the price, well, it's definitely affordable. This is a gorgeous green amethyst ring! Love it! The stone is so beautiful! 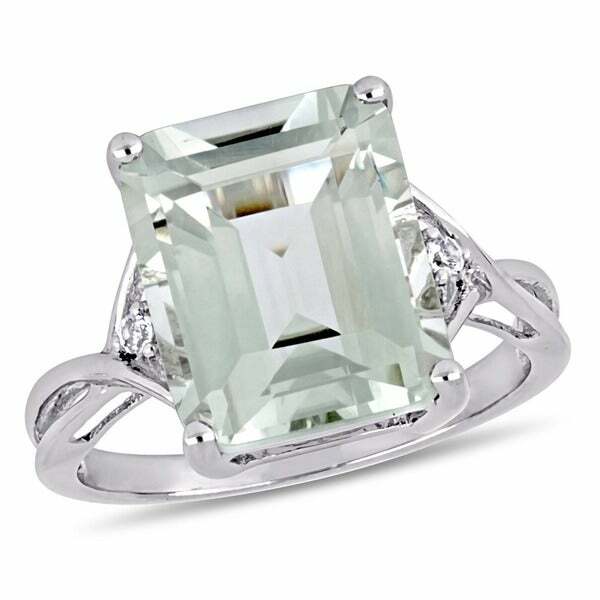 The whit topaz stones are a beautiful complement to the light green amethyst! This is a rich-looking ring. Would not buy this again unless the stone was centered and the setting was bent or just not made right. Nothing is in alignment with this ring. It is very pretty and looks just like the picture. It is simple yet elegant. i was hoping this ring would look as pictured, but when it arrived the stone was almost colorless. I was disappointed and sent it back. I loved the color of the stone in the picture online. However, when I received the ring, the stone was a very, very light pee yellow (almost clear). Since the ring is only ***, I will not bother with the hassle to return it. But I won't be wearing it very much. I love how simple the design however i wish the stone was a little smaller and had more color. The Seller shipped it promptly. The Silver is good quality, but unfortunately, the Green Amethyst looks completely clear, not at all green. I'm not at all happy. I can buy a cheap clear stone anywhere, that's not what I wanted. Georgeous stone and lovely setting. Gift for myself! I bought this ring but sent it back. It was truly gorgeous but I feared I would never wear it. Some time later I changed my mind and came back for it. Unfortunately, my size is sold out. Pretty...but not gorgeous! I've worn it about 3 times but it just doesn't do it for me. If it appeals to you, please don't base your decision based on my review! We all have different likes and dislikes! I am hoping this ring will grow on me eventually! LOVED this ring!!!! Thank you! Beautiful ring with a perfect green color. No regrets buying this. Yes, ring is very pretty. Quality of stones are brilliant. The ring is beautiful and I wear it with jeans or dress up. "Can any of these rings be converted into stretch rings?" I'm not quite sure what a stretch ring is but this ring has a solid band that leads into the shank of the ring. "Is this ring true 925 sterling silver? " I guess, its a beautiful ring and has held up well. yes it had the 925 sterling silver stamp, but i returned it because the stone color was very light and I wanted a more intense green color. Yes It is sterling. I had the ring checked out. "Does this ring come in london blue topaz "
No I don't believe so. The green is very pretty! "Is this a lab created or genuine amethyst?" I am sorry I don't know the answer to that. But I can tell the stone is really really nice!! I got this for my mom for Christmas, she loves it and she is SO picky! This is a genuine green amethyst, and it's beautiful! I was able to get it in a 5 1/2 and it fits perfectly! I love mine! 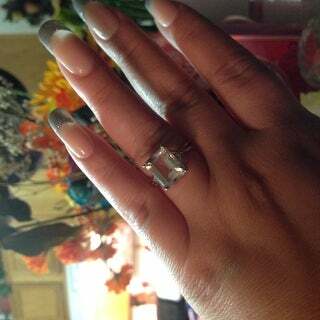 "Ive noticed since i got my ring the stone looks cloudy after about 2 weeks. I have cleaned it and dried it off vry well but it still looks cloudy. Why is this? How can i gt the shine back that it had when i first bought it?? help!!" This needs to be wash with mild soap / check with your local jeweler. "I ordered this a few days ago and got a confirmation but I have yet to get any email about my purchase or 'on route, info. Andrea ****"